Prominent CNN personalities on Thursday accused White House press secretary Sarah Huckabee Sanders of posting an altered video to suggest CNN White House correspondent Jim Acosta inappropriately made contact with a White House intern over control of a microphone. Sanders posted a video Wednesday of Acosta maintaining his grip on a microphone as an intern tried to take it from him during a news conference with President Donald Trump. 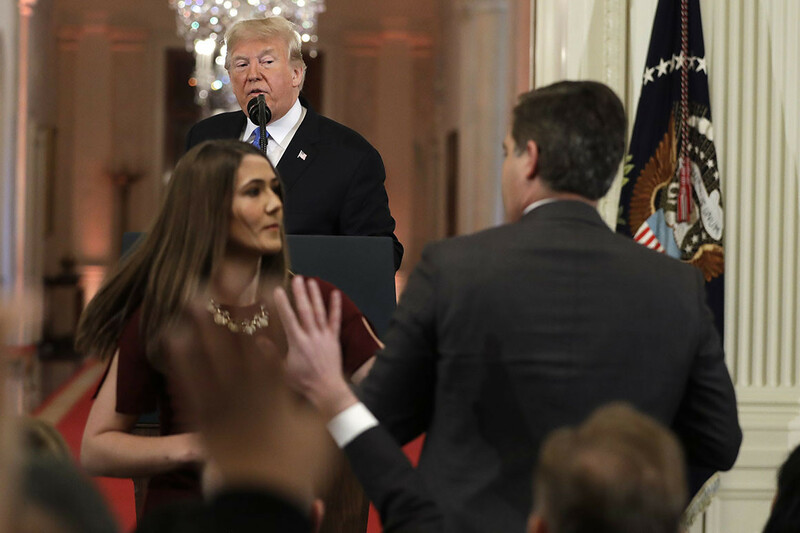 Sanders used the video as justification for the White House revoking Acosta’s press access Wednesday evening — a move that was met with immediate and fierce condemnation from other journalists. On Thursday morning, CNN’s Matt Dornic, vice president of communications and digital partnerships, and Brian Stelter, chief media correspondent, both claimed the video had altered speeds to make Acosta seem more aggressive and the intern more demure. “Absolutely shameful, @PressSec. You released a doctored video – actual fake news. History will not be kind to you,” Dornic wrote, tagging Sanders’ official Twitter handle. Dornic and Stelter suggested the video might have come from the far-right website InfoWars, which has been booted from mainstream social media sites for peddling inflammatory conspiracy theories. Sanders argued later Thursday that the point of releasing the video was to show Acosta made contact with the intern. She did not address whether the video was doctored or whether it came from InfoWars. Paul Joseph Watson, an alt-right YouTuber with ties to InfoWars, had posted a similar video earlier Wednesday evening. Watson on Thursday denied speeding up the video to make the contact look more aggressive, saying he only zoomed in. He posted a screen shot of the video editing software he said he used, which he said proved the video was not doctored. But a side-by-side video comparison by Slate’s Aymann Ismail shows Acosta’s hand touching the intern slightly faster in the White House version of the video than in a clip posted by NBC, suggesting Acosta’s arm was sped up. A White House intern attempted to pull the microphone away from Acosta as Trump dismissed his question, but Acosta held onto the microphone, pulling it away from the intern. “Pardon me, ma’am,” he said during the increasingly tense moment. The White House later revoked Acosta’s press pass, with Sanders tweeting he behaved inappropriately by “placing his hands” on the intern and by taking too much time from other reporters by pressing the president to answer his questions. The move was quickly criticized by journalists from multiple outlets as censorship. The White House Correspondents’ Association released a statement urging the White House to restore Acosta’s access. “Revoking access to the White House complex is a reaction out of line to the purported offense and is unacceptable,” the statement said. CNN anchor Jake Tapper tweeted a statement from Whitney Shefte, president of the White House News Photographers Association, condemning Sanders for posting a possibly altered video. But the Trump circle continues to place blame on CNN for behaving in a disorderly manner. Acosta is one of the most recognizable White House reporters and has gained both admiration and notoriety for his aggressive approach. Sanders said Trump has granted unprecedented access to the press, exemplified by the 90-minute briefing on Wednesday. During a Thursday appearance on Fox News, counselor to the president Kellyanne Conway defended the president for fighting back against what she said is a hostile press. Trump has referred to some unidentified members of the news media as the “enemy of the people,” and has substantially cut down on solo news conferences, like the one Wednesday, compared to other presidents, opting instead to communicate through his press office or take questions more informally around the White House. "viraltopiczone.com" is your news, amusement, sports and business accomplice site that gives you the most recent breaking news and recordings which refreshed you as a matter of first importance. Is the US using aid as a foreign policy tool?